The Reprotec team welcomes you on its website! Efficient in digital printing technologies since 1991, Reprotec began his career in the neighborhood of Plainpalais in Geneva. In 2008, in this exponential market, our company expands and moves to new office in the Lignon (10 chemin du Château Bloch). Reprotec is a Geneva company and succeeded by the opportunity offered of the explosion from the digital technologies and the new production opportunities readily available in this area in constantly changing. Our practice of low price has not changed since many years. Our firm has always remained consistent between the quality of the performance, the continuous availability and the prices. 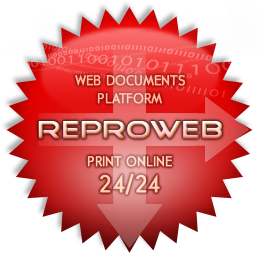 Print your plans 24/24 with the Reproweb print platform, Service available only for professionals : General builder company, engineers, architects, etc.